The Corrupt Mouse is a breed of mouse that can be found in the Cursed City. It is not known to drop any loot. The Corrupt Mouse has been found to be especially attracted to Graveblossom Camembert, to the point that any other kind of cheese will simply not suffice. The Corrupt Mouse is a typical member of the Lost City mouse group. As such all power types except Arcane weapons are ineffective against it. 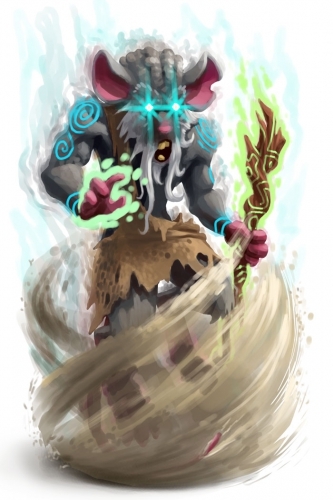 During the Fear, Darkness and Mist Curses Minigame, the Corrupt mouse will not be attracted for the first three hunts after all three curses have been lifted via a Bravery, Clarity, and Shine charm, unless the hunter is using a Shattering Charm. The Corrupt Mouse drops the Corrupt Egg during the annual Spring Egg Hunt. 14 November 2012: The Corrupt Mouse was released as part of the Living Garden update. Prior to 14 January 2013, it was possible to have three hunts without attracting a Corrupt Mouse after any one curse was lifted, rather than after all three curses. This page was last edited on 17 May 2017, at 17:28.